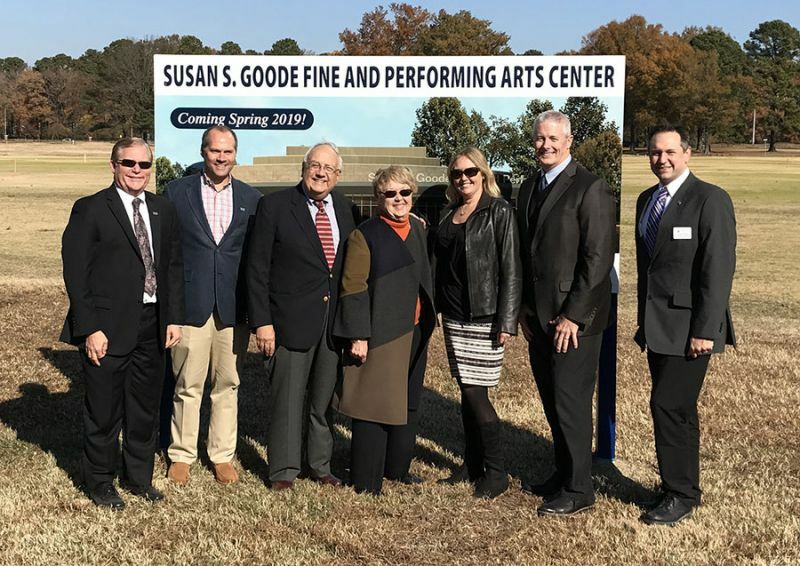 Virginia Wesleyan University broke ground December 1 for the Susan S. Goode Fine and Performing Arts Center. The 23,200-square-foot academic facility is scheduled for completion in early 2019 and will feature an impressive glass-enclosed grand lobby and 300-seat theater. Theater support spaces will ring the stage, including a scene shop, dressing rooms, green room, costume, prop, and equipment storage. The front of the building will feature inspiring landscaping, a plaza for outdoor programming, and a peaceful lake surrounded by natural green space. The center will also serve as a unique venue for visiting speakers, honorary inductions, and awards ceremonies. Nationally recognized philanthropist Susan Goode is the namesake of the center, as well as the University’s Susan S. Goode School of Arts and Humanities. She has been an active member of the Virginia Wesleyan University Board of Trustees for over a decade, chairing the Board’s Academic Affairs Committee since 2015 and serving as secretary of the Board during the 2014-15 academic year. She and her husband, David Goode, are enthusiastic advocates for the arts, not only recognizing the importance of these disciplines, but believing they are fundamental to a comprehensive liberal arts education. Other special guests included Jon Pruden, Vice Chair of the Virginia Wesleyan Board of Trustees, and Jane Batten, Trustee Emerita; Travis Malone, Dean of the Susan S. Goode School of Arts and Humanities and Professor of Theatre at VWU; Tymoff+Moss architects John Tymoff and Michael Schnekser; Hourigan Construction representatives Chris Brandt, Executive Vice President, Eric Harrison, Superintendent, and Clark Lambert, Senior Project Manager; and prominent local arts leaders Erik Neil, Director of the Chrysler Museum, and Tom Quaintance, Producing Artistic Director at the Virginia Stage Company. This is only the first phase of a new arts complex at Virginia Wesleyan. The University expects to renovate studio spaces and classrooms in the existing Fine Arts Building. 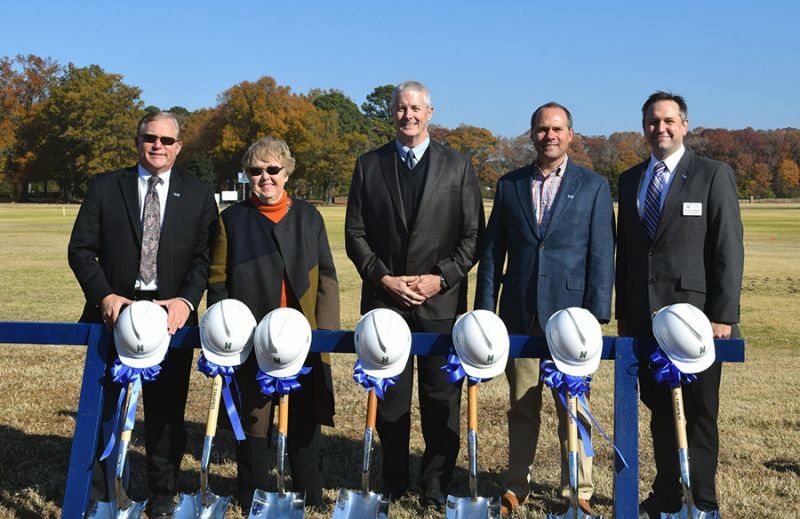 These updates, coupled with new construction and additional planned expansion, will enhance the University’s fine and performing arts facilities and showcase the prominence of Virginia Wesleyan’s arts program to the community. Construction of the Susan S. Goode Fine and Performing Arts Center is part of an impressive list of growth initiatives and progress at the University in the last two years. The institution structured its academic program into three schools, initiated the Batten Honors College, transitioned from a college to a university, and launched graduate programs and a new online learning division through its newly formed University College. The Virginia Wesleyan University Softball team won the NCAA Division III National Championship, and its men's and women's swimming teams held their inaugural meets. The state-of-the-art Greer Environmental Sciences Center and the Frank Blocker Youth Center opened, and the Betty S. Rogers Track & Field Center was dedicated. “The University is at a wonderfully successful point in its history, and I could not be more proud of our students, faculty and staff, alumni and friends,” President Miller said.